The Keys To Color: A Decorator's Handbook for coloring paints, plasters and glazes. This book is for decorators. inspired amateurs, working painters and artisans who seek to enhance their knowledge of color as it is used over large areas like walls and ceilings. Discover a different approach to color than that written for artists. Although the rules of color stay the same, the goals are quite different - new methods have to be learned. Learn how to make your own colors, match existing colors and fix them if they are wrong. Begin by learning how to see colors and how to understand why they act the way they do. Delve into advanced topics like pigment qualities, options and choices to the way pigments react with each other and why. This is the first time in eighty years that practical color theory has been addressed for architecture. Many of the materials used for interior design like paint, plasters, glazes and stains are explained in detail. Develop an understanding of advanced color topics like constructing complex and full-spectrum colors, working with metallic and mica paints, and using color in interior design. The Keys To Color is the first book in eighty years to address practical color theory for interior design and architecture. In simple, easy-to-understand language, discover a different approach to color. 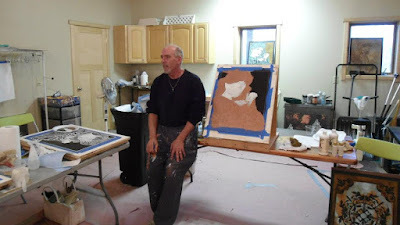 Learn from a top-rated instructor how to make your own colors, match existing colors and color-correct them as needed - vital skills for the professional designer and decorative painter. Learn how to see colors and understand why they act the way they do. Delve into advanced topics like using complements to adjust color, working with metallics and micas, and creating complex and full spectrum colors. Although the rules of color stay the same for artists and designers, the goals are quite different and new methods are offered for professionals and inspired amateurs. An essential book for those working with color in decorating schemes.